Signature dishes - these seem to define many of the restaurants in this town. Not a bad strategy if you ask me. Think of it, make something well and people will remember it, even if the rest of the food is forgettable. Or better yet, hype up a signature dish, even if it is pretty "meh". And not surprisingly, people will still flock to try it because of the endless promotion. I'm not saying we are all lemmings, but it is pretty obvious customers can identify with a certain product, it is forever memorable or associated with that restaurant. 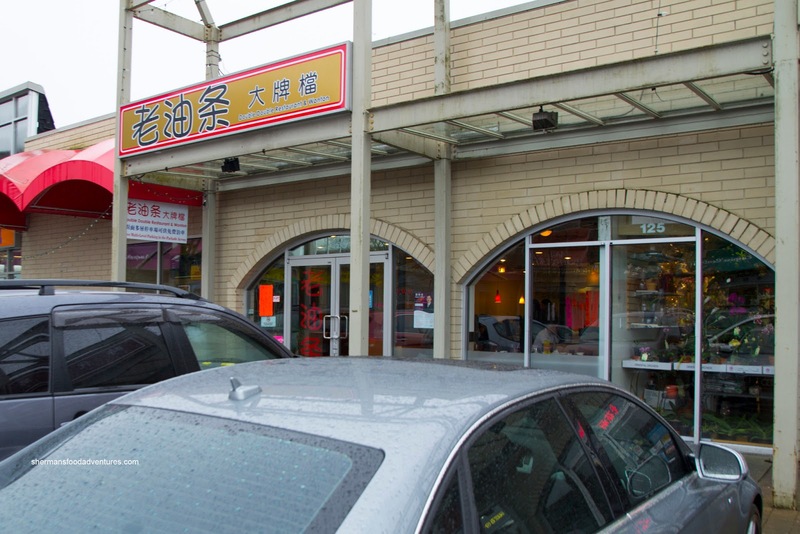 Case in point, the former location of Double Double out on Kingsway was synonymous with their Yau Ja Gwei (Salty Donut). Unfortunately, it met an untimely end due to a kitchen fire. For many years, their outstanding salty donuts were nothing more than a fleeting memory. Fast forward to the present and they have reopened (about half a year ago) in Richmond offering up the same things (and some others) that made them famous. Once again, we made the trek out to driving hell for some grub (curse you good grub!). 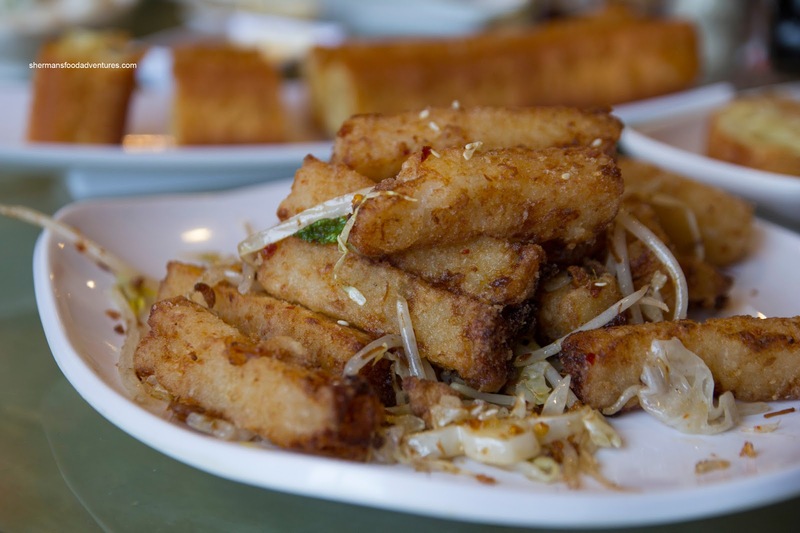 And without further ado, we started out with their Yau Ja Gwei. What a complete letdown... First of all, it was not fried to order, so it was stone cold. Second, it was fried too long, where it became chewy and heavy. This was not what we were looking for and really, there was no excuse for not making to order. It's their signature item for heaven's sake! Suffice to say, their Sweet Donut was not any better as it was even colder and more dense (because it is thicker). Not impressed at all. I realize they were packed and very busy, but if these are your signature items, put the effort to make them right. 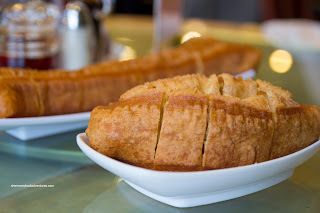 Thankfully, another one of their more popular items was mostly prepared right, being the XO Fried Daikon Cake. These were cut into strips, deep fried, then wok-fried with XO sauce and other seasoning. That other seasoning was MSG as the whole dish was very salty and far too flavourful. It was really too bad since the daikon cake was soft in texture with lots of daikon. The exterior was lightly crisp kissed with a nice spice level. 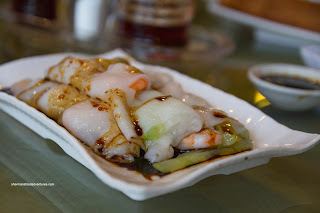 Moving onto the Shrimp Rice Noodle Rolls, we found it a bit unusual for there to be slivers of Mo Gwah (Hairy Cucumber) mixed with the crunchy shrimp. Whatever the case, they were soft and added so veggies to the dish. As for the noodle, it was buttery soft with some elasticity. I found it to be just the right texture. Now with the 2 orders of donuts, it was only fitting to get a bowl of the Minced Beef Congee. It arrived steaming hot and really thick, however, it appeared to be due to the addition of starch. 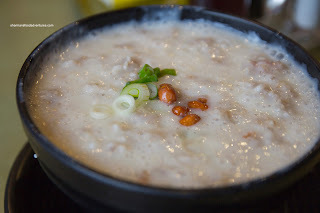 That made the congee a goupy thick rather than a smooth thick. The plethora of tender beef mixed with fried mung bean thread was good, but we couldn't get over the amount of MSG they used. Boy was this far too flavourful... And along with the congee, we got another specialty being the Wonton Noodles. 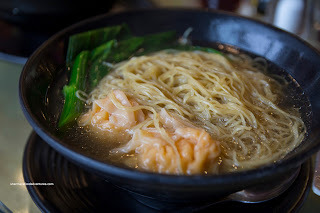 This was good with chewy al dente noodles nestled in a flavourful sweet broth. The wontons featured whole crunchy shrimp which packed a whole lot of natural flavour. 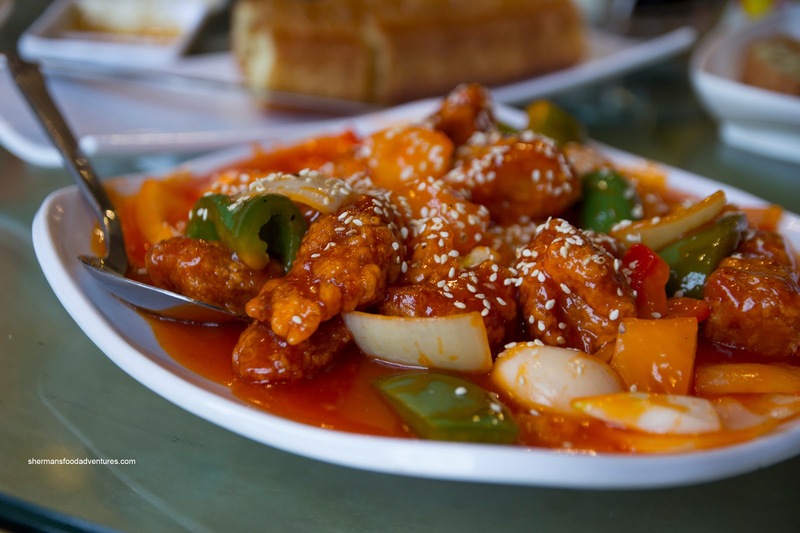 While we were perusing the menu, we noticed that the Sweet & Sour Pork was described as "soooo good!". Okay, we'll see about that... Yes, they were pretty good being crispy on the outside while juicy on the inside. There was probably too much sauce on the plate, but at least it was balanced where the sweet and sour were distinctive. 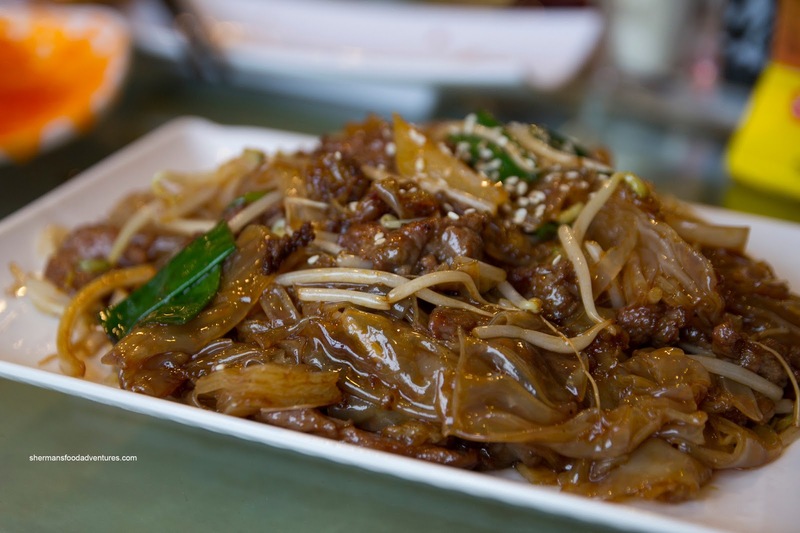 We added a few things at the end including the Stir-Fried Crystal Noodles with Beef. It arrived glistening like a teenager's forehead. And yup, it was super greasy and OMG salty. Both MSG and soy were used liberally in this dish. Too bad since it was good otherwise with nicely textured noodles and tender beef. 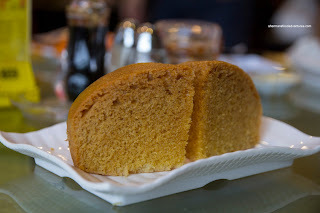 We finished off the meal with something sweet (with no MSG) in the Steamed Sponge Cake. It was semi-sweet, rich (from the lard I'm sure...) and fluffy. Thankfully this was a mild finish to an extremely salty meal. Don't get me wrong here, there were some good eats, but with the salt and MSG content in the food, it eroded our overall experience. Not to mention, the disappointing donuts. We had high hopes, but ultimately, they failed to deliver a complete meal. Sounds like their reputation far exceeds expectations. Too bad. Fried donuts are only good if they're fresh and that's that they built their name on. If they continue this way, they will lose customers as there is a lot of competition in Richmond for good food and discerning diners. @LR Sorry, I don't buy it. At the very least, it should've been made to order. I didn't visit Double Double for a donut that had been sitting around. Would one visit Pizzeria Farina for a pizza that has been made ahead of time? They can't serve their signature item in that fashion. No excuses whatsoever. Remember, I got both the salty and the sweet. Both cold and hard. As for the S&S Pork, yes, less sauce the better. It should cling to each piece with some crispy batter still showing. My father-in-law used to run a big Chinese restaurant in town. He did it right. That's a shame. I was actually in Richmond downtown today and a lunch at DD actually crossed my mind, but I was unable due to logistics and timelines (ended up eating at Admiralty Centre's food court ..... sigh). Maybe I ought to re-consider from now on. @LR I forgot to mention that it wasn't only the donuts that were disappointing. There was so much salt and MSG in the food, I thought my blood pressure was going up! @LR What's wrong with eating at Admiralty Centre? They have one of the best wind sand chicken stands there. Also, I have a couple of places on my list of to try places there. Ok, so the vibe there is very empty and sad, but if you close your eyes and just concentrate on the food, it's tolerable. @Holly - I wasn't familiar with Admiralty Centre's food court and hence wasn't prepared knowledge-wise on what is good there. My dad and I ordered from the PollyTaste curry place (gotta love that name) and my mom ordered from the noodles joint at the far left end. All our choices were pretty average. What's the wind-sand chicken and which vendor offers it ? Now I'm intrigued. And what are the other two places you've been meaning to try ? @Holly again - actually we had business to take care of at Pacific Plaza, but after I took a 360-deg glance of the food court, I'm glad I went over to Admiralty's food court, which seemed infinitely cleaner and more cheerful than PP's. But for future reference, is there anything at Pacific Plaza food court you'd recommend ? @LR Hey there. The name of the chicken place is Ocean King Congee. I also want to try the bubble waffle at Your Dessert. It was closed the last time I went. Oh, and the bakery on the main floor has awesome breads, like their pumpkin bread. You have to get there early as they often sell out. PP? Not really. Just Bubble Queen that has a really good special mango bbt. They make theirs with lots of fresh chopped mango on top. Delish. They must have read your review. 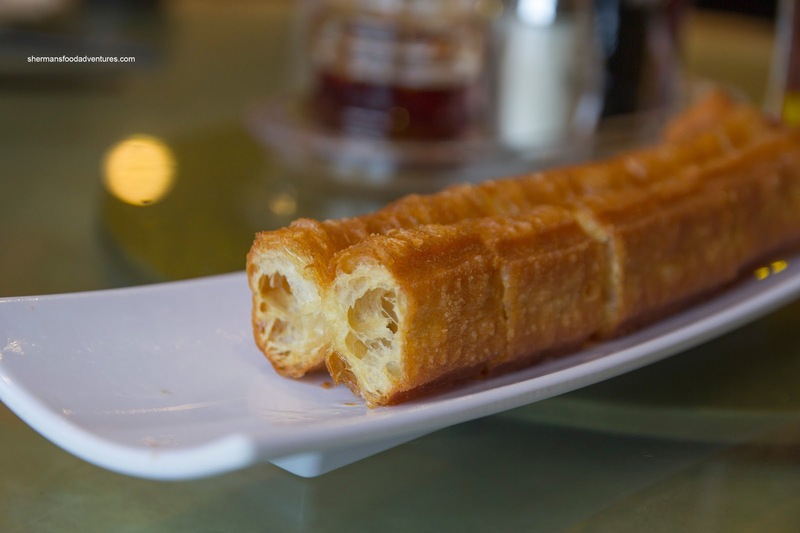 I was there today and ordered their donut to go with my congee. They asked if I wanted to wait 10 min for a fresh batch or I could have a "warm" one now. I also notice they like to announce out loud whenever they bring out a fresh batch of donuts. I found their donuts not too greasy also. @Stan Good to hear they make it to order now. What a shame that I didn't experience that. Sherman is right about the MSG! And the service ? -- just horribly horribly crappy! Yes, it was very busy, so we were willing to wait for for good tasting food, and wait we did -- almost an hour. That wasn't an issue. As I can't tolerate more than small amounts of MSG in my food, we asked the waitress to be sure to ask the cook not to add MSG. She didn't say anything but gave us this very dirty look. I thought, oh this certainly does not bode well. Well, our food arrived, and sure enough I could taste the MSG -- it was just loaded with it. The next morning my face and eyes were completely swollen and I woke up with a pounding headache. We've been here three times, thinking maybe with different waiters/waitresses the service would be different. Nope, same crappy service and lousy attitude. Never do that again. Food is just not worth the morning after pain! With so many great restaurants in Greater Vancouver, why should I have to spend money for this? !